In May 2014 the airport in Donetsk became the object of fierce fighting. There has been much discussion as to why it should be so important to both sides in the conflict. Initially, there was no reason for such discussion – an airport is always an important infrastructure facility, and whoever controls it is master of the situation, able to receive flights laden with freight and human resources, to send the wounded behind the lines etc. In a word, nothing surprising about that. But the longer the battle continued, the more mysterious the significance of this airport became. The take-off/landing runways had long since been bombed to smithereens, and there was no longer any point in fighting for the infrastructure. The word was that the air traffic control tower was of strategic importance, but the next round of fighting destroyed that too. 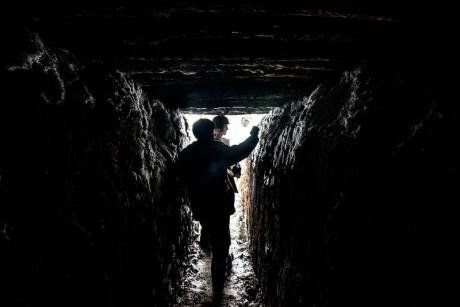 Then there were rumours of an underground network of passages, which could have been centred on the airport: apparently these corridors were used to supply reinforcements from Ukrainian government forces stationed not far away, to take the place of soldiers who had been killed. The nickname 'cyborgs' given in Ukraine to defenders of the airport arose because they were attacked every day, but they continued to hold out – as if they were not people, but robots – and separatist supporters liked to say that the whole secret of their tenacity was in the constant underground rotation i.e. they are killed, and then others are brought in underground. The New Year rotation of the 'cyborgs' in front of TV cameras created a phantasmagorical impression of a war game. However, the actual rotation, agreed by both sides at the end of the year, gave the lie to these rumours. There are no underground passages: the soldiers are brought in through the corridor provided by the separatists, with the wounded being taken out by the same route. The New Year rotation of the 'cyborgs' in front of TV cameras created a phantasmagorical impression of a war game not unlike paintball, rather than war itself. Deadly enemies, who had more than once demonstrated their ability and desire to kill each other, suddenly started interacting like the players in a video game. The separatists let Ukrainian soldiers into the citadel, checking that each one had a machine gun and 90 rounds – the very same rounds the cyborgs were to use to kill the separatists. Now that the airport has fallen, its significance and the sense of the many months of fierce fighting are even less clear. The Ukrainians prefer the face-saving formula that says 'the airport has been destroyed and there is no longer anything to defend'. Ukrainian social media users favour a poster with the words 'The cyborgs held out, the concrete didn't'. On Russian TV, however, the separatists rejoice at their victory. On 22 January, the coffins with the corpses of dead cyborgs were handed over. They will certainly become national heroes in Ukraine – so certainly, in fact, that no one will ever dare to ask what they actually died for. In the battle for the airport there were various rules in operation: for both a war of extermination and a savage game; and the plot for a thriller, when no one knows the real significance of what is happening. As such, this battle could well be a very precise metaphor for the whole of the Donbas war. 'Russian spring', 'Russian world', and 'Novorossiya' (New Russia, a Russian Empire colonial term for the territory conquered by Catherine the Great, north of the Black Sea, stretching from Donetsk to Odessa) were all slogans, which were only applied, and had validity, during the first few months of the conflict. No one talks any more about the 'land corridors' to Crimea and the breakaway Russian enclave of Transnistria, which were, at the time, apparently, the given motivation for Russia to become involved in this conflict. And the fact that the war was the result of local inhabitants' dissatisfaction with the revolution in Kyiv is also not remembered. There is a vague memory of reprisals against the last independent local field commanders: the Luhansk field commander Bednov (nickname 'Batman') who was murdered at New Year was hardly a knight sans peur et reproche, but the attack on his car from a rocket launcher and a flame thrower by forces under the control of the Luhansk leader Igor Plotnitsky created a very sinister impression on even the most diehard supporters of the 'Russian Spring', whose slogans actually said nothing about burning people with flame throwers. But slogans no longer have any meaning: the rhetorical demands issuing from Moscow and the separatists are already considerably more moderate than they were last summer: special status within Ukraine, local elections – and no more than that. One of the Novorossiya ideologues, Aleksandr Chalenko, in one of his debates about the role of the pro-Russia super-activist volunteers said on Facebook, possibly even too frankly, 'My homeland was liberated, and remains so, thanks to the Kremlin; the Kremlin did battle for it, and continues to do so. If Novorossiya still exists, then it's only because of the Kremlin. But what does the Kremlin want? Political experts have a standard range of answers to this question. The Kremlin has an interest in maintaining Ukraine in a state of constant tension so as not to allow the Ukrainian government any hope of peaceful development or a chance to demonstrate the advantages of democratic reform as compared with Russian authoritarianism. But these explanations only confirm already existing facts. Yes, there is a seat of constant tension in eastern Ukraine, not unlike Transnistria in 1992. But who needs Transdnistria now, and what for? No one, but it still exists in the same form as it did 20 years ago, because no one knows what to do with it. Most probably the same history will be extended to the 'Novorossiya' project. Last spring, Russia assisted with the launch of an ambitious anti-Ukraine project, which became ever less ambitious even as it was being realised, arriving finally at a point from which there is no way forward (or back). This is war without a clear aim, war without any practical sense – a dangerous war game in which the cost of human life is reduced to nothing; like the battle for the airport, but on a much bigger scale. 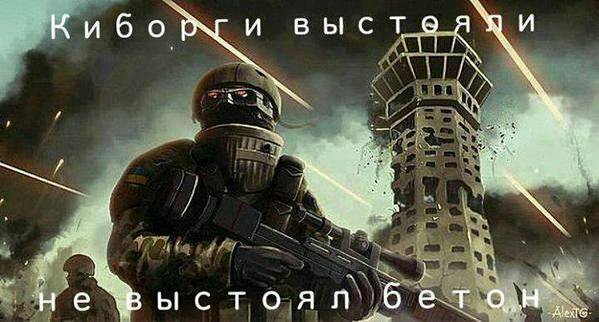 Standfirst image: 'Poster of 'cyborg' defending Donetsk airport with the caption 'cyborgs held out, the concrete didn't' via pbs.twimg.com (c).